A growing, aging population; the rise to epidemic proportions of various chronic diseases; competing, often overlapping medical technologies; and of course, skyrocketing costs compounded by waste and inefficiency - these are just a few of the multifarious challenges currently facing healthcare delivery. An unexpected source of solutions is being imported from the manufacturing sector: lean thinking. Lean Principles for Healthcare presents a conceptual framework, management principles, and practical tools for professionals tasked with designing and implementing modern, streamlined healthcare systems or overhauling faulty ones. Focusing on core components such as knowledge management, e-health, patient-centeredness, and collaborative care, chapters illustrate lean concepts in action across specialties (as diverse as nursing, urology, and emergency care) and around the globe. Extended case examples show health systems responding to consumer needs and provider realities with equal efficiency and effectiveness, and improved quality and patient outcomes. Further, contributors tackle the gamut of technological, medical, cultural, and business issues such as the likes of initiatives of service-oriented architecture towards performance improvement, adapted lean thinking for emergency departments, lean thinking in dementia care through smart assistive technology, supporting preventive healthcare with persuasive services, value stream mapping for lean healthcare as well as a technology mediated solution to reduce healthcare disparities. 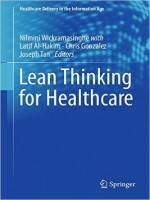 Geared toward both how lean ideas can be carried out and how they are being used successfully in the real world, Lean Principles for Healthcare not only brings expert knowledge to healthcare managers and health services researchers but to all who have an interest in superior healthcare delivery.